Last Sunday was beautifully horrifying. I sat staring into the 8-bit stream of NFL RedZone that my computer is capable of hijacking overseas, worrying. Not because everything was going awfully, but because everything was going great. After a miraculous comeback cover in overtime by RUSSELL HUSTLE BUSTLE WILSON and company, my drunk picks were looking like they might go 5-0, which would mean another night of Sambuca and misery come this weekend. 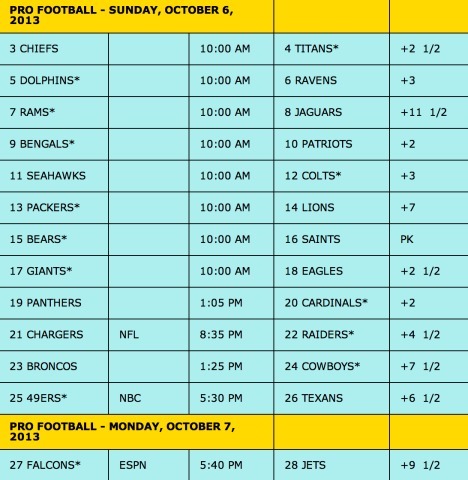 Thankfully, my Philadelphia Eagles couldn’t come close to covering +10.5 against the Broncos, and my picks settled at an absolutely brilliant 4-1. I am not bad at this, folks. For anyone late to the SuperContest party, feel free to check out my Week 1 picks, where I explain this whole charade. Now, for the Week 5 table, minus the rebirth of the Cleveland Browns as an NFL football team, which we witnessed Thursday night. Home teams get the asterisk. Uh oh. I feel good about this week. That is a bad thing. As I have said before and will say again, Vegas knows more about gambling than we do. Whenever you feel like you have an edge, the smarter decision is to go against it. But I feel good right now. We’re going to take this city for all it’s worth. At first glance, this line looks like it has “trap game” potential. For the uninitiated, or normal people with real lives that don’t have time to read a bunch of gambling columns and listen to gambling podcasts and such, a “trap game” is a game in which the favorite seems not to be favored enough, encouraging bettors to lay loads of money on them. Vegas, being smarter than we are, knows what is going to happen, and usually has a reason for making the line lower than the public is expected. Then, something crazy happens in the game, and the underdog somehow wins outright, and sportscasters spend the next week spouting about how “No one could have expected a performance like this” from the underdog. Usually, the underdog is at home. In Vegas, this line has moved to 9 after opening at 7.5, meaning that the world has bet the Broncos so hard that Vegas had to add a full point and a half in order to entice bettors to take Dallas. This is another scary sign, one that would normally call for me to go “contrarian” and take the Cowboys. Again, this smells, maybe even reeks of trap game. So why go against this rule that I just spent a paragraph explaining? Because this line is ridiculous. Ludacris even. And Peyton Manning is immune to these rules that we created for our plane of humanity. He is above us. The Cowboys have not impressed anybody so far this season. They needed six turnovers to barely beat the Giants at home in Week 1, and the Giants still haven’t won a game. The Cowboys are a part of the God-awful NFC East. The Broncos closest game has been a 16 point victory over the Raiders. That means that the Cowboys have to play nine points closer to the Broncos than any team has so far this season in order to cover. I get the arguments about the unsustainable pace that the Denver is playing at right now, specifically those about Peyton Manning. But what you, the reader, must understand is what Bill Simmons noticed just last week: we are not dealing with any normal Peyton Manning right now. This is Evil Peyton Manning. Evil Peyton Manning makes no mistakes. He is a machine built for gridiron destruction. Evil Peyton Manning will steal your girlfriend, eat your dinner and then score eight touchdowns on your favorite team. Stat heads might see that Evil Peyton Manning has thrown 16 touchdowns and no interceptions and conclude that he is due to regress, as it is impossible to continue at that pace over the course of a full season. This is probably true; some goon receiver will tip a pass into the air and straight into an opposing free safety’s hands who will take it straight to the house. But fictional stat head that I made up for the purposes of telling you you’re wrong, allow me to tell you, you’re wrong. Because as soon as that free safety scores that touchdown, Evil Peyton Manning gets the ball back. And he will lead the Broncos down the field in two minutes and score again. Because Evil Peyton Manning can score at will. Nothing can stop him, especially not the Cowgirls. This is a pick for the Saints as much as it is a pick against the Bears. And not even all the Bears, mostly just Jay Cutler. 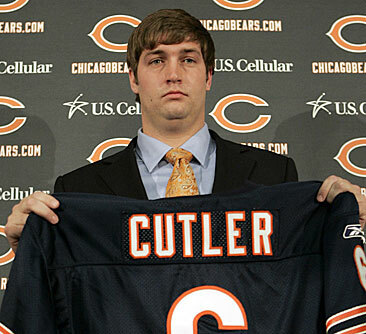 And not even all of Jay Culter, mostly just his face. 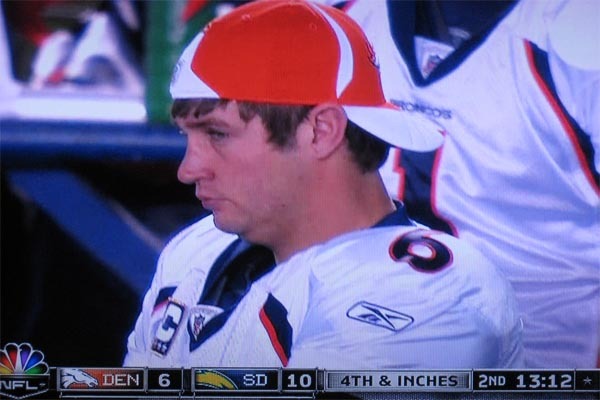 But jokes about Jay Cutler’s face aside, the Saints have looked great. They look confident and happy to have their coach back, nothing at all like Jay Cutler’s face. They’re offense is running like clockwork and their defense looks stronger than I expected, much stronger than Jay Cutler’s face. But seriously, besides Jay Cutler’s face, the reason I am picking the Saints here is because when I was guessing what this line would be, I was thinking that the Saints would be at least three point favorites. Instead, it is a pick’em. Sure maybe it smells like a trap game just like the Broncos game above, but it doesn’t smell as bad as whatever Jay Cutler’s face seems to be smelling in all of these photos that I have linked to. Come on, Drew Brees. Save me. The Lions score a lot of points. They are getting seven on top of however many points they are able to score against the Packers on Sunday. It’s possible that we are due for a “Matthew Stafford blows it” game, or a “Ndamukong Suh stomps someone in the face and ruins things” game, or simply a “Lions game” in which everything falls apart. The Packers need a win bad or their season might be over, and they might want to take it to a division rival in order to prove to the rest of the league that they still have some fight in them. That’s cool, do you. Just don’t win by more than seven. WHY DO I KEEP PICKING ON THE TRAP SIDE OF TRAP GAMES? Oh gosh. All those good feelings I had when I first looked at the table are starting to waver. I’m betting on Philip Rivers for the THIRD time this season already, and we are only five weeks in. This can’t be happening. I am in some awful nightmare where I pretend to know what football is and get crushed by some bookie that wants my kneecaps. Just promise me one thing: remember my picks when I’m dead. And then, all at once, a calm came over Tyler Lauletta. It was a calm he had felt before on Sundays, comforting in its familiarity. In the distance, a beautiful stallion of a man was approaching. He had the arms of an olympian, and a smile that was contagious. He paused to allow time for this sentiment to take hold within his student. “Do you think I can do it again?” Tyler asked, hoping his mentor would give him the answers he wanted to hear. “If you believe in yourself, and believe in me, than everything will be as it should. But I must leave you now, Tyler. Be strong. And know that whenever I am out on the field, I will HUSTLE, and I will BUSTLE, and you will know that I am doing it for you, and all of those who believe in me.” And with that, RUSSELL WILSON gave Tyler a pat on the shoulder and began to leave. “Wait, RUSSELL!” Tyler called out, just as WILSON was about to fade into the horizon. “I know.” he replied, with a shy look to the floor. “Happy Sundays.” said RUSSELL cheerfully, as he jogged back to the great practice huddle in the sky. What just happened? Did I just have a vision? I’m not even drunk this week. What is happening? Wait. It doesn’t matter. I just have to say something. I talked a lot about Evil Peyton Manning at the top of this column. I complemented his playing attributes as if there was none higher. But there is one higher. And HE needed me to remember that. 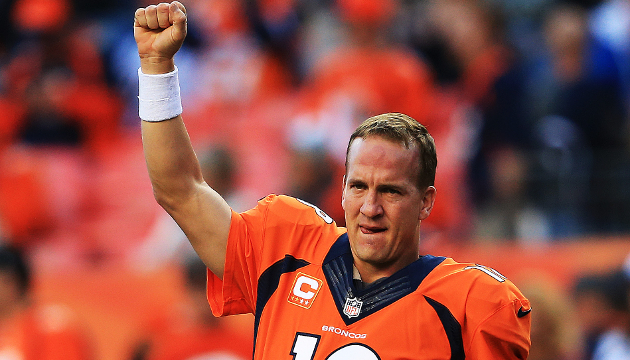 Evil Peyton Manning may be a perfect football playing machine. 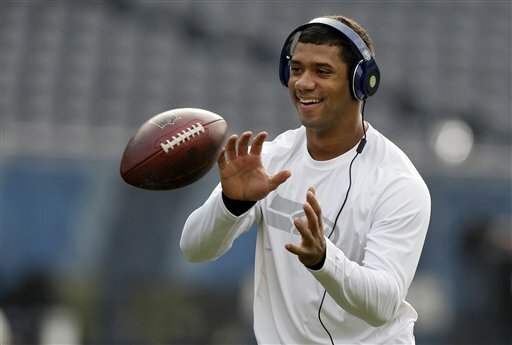 But the HUSTLE, the BUSTLE, the RUSSELL WILSON is a God among men. I may have picked five road teams to cover and I may have been way too overconfident in my picks and I may have stretched this column way to close to 2,000 words with a lengthy story that didn’t make a ton of sense. It’s how RUSSELL would’ve wanted it.